riding the East Australian Current! It's okay, dude. He's totally chill. The Righteous Defender is a package of value. It's a straight-up upgrade over the Argent Squire, having the same stats and Divine Shield, but adding Taunt to boot. Plenty of aggressive and board-flooding paladins run Argent Squire, so upgrading to this (or playing both) is just about a certainty. This card gets the first Excellent rating of this series. 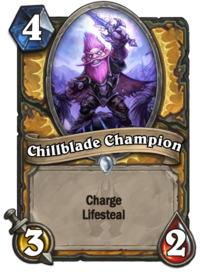 Chillblade Champion is one of the few cards introduced with the Lifesteal mechanic thus far, which, you might recall, first saw the light of day with an uncommonly-encountered warlock card, the Mistress of Pain. As a class card with Charge, Champion compares to the Kor'kron Elite, losing 1/1 in stats in exchange for Lifesteal. 3/2 is a pretty poor statline for 4 Mana, and I'm not sure the Lifesteal makes up for it. That said, this card combines well with attack buffs (both from spells and minions) and with paladin's Grimy Goon hand buff cards. A buffed-up Champion can trade with a big enemy minion and provide you with a big heal, for instance. 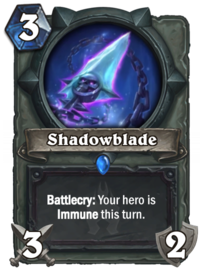 It does have the disadvantage of costing the same amount of Mana as Truesilver Champion, which is a better card overall. You probably won't use this card except in a deck that takes advantage of its features through buffing, so I think it at least merits a Fair rating. The Howling Commander is a decent addition to a class that, at least in Standard, can struggle with card draw. It's an alternative (or a complement) to, say, Small-Time Recruits. You can use it in a variety of decks, although it probably works best in decks with a handful of stronger Divine Shield minions. You probably don't want to depend on it to draw only into the likes of Tirion Fordring, since it's a waste of space if you draw Tirion before getting to draw or play the Howling Commander. Fortunately, you have other options. A 2/2 body for 3 Mana isn't great, but minions that draw cards usually have weak stats, so that's all good. This card isn't super-strong, but I think it's at least good enough for a Fair rating. 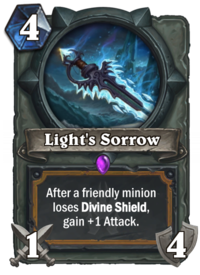 Light's Sorrow is a weapon with a curious effect: it's a 1/4 for 4 Mana, which is pretty weak. (Light's Justice has the same statline for 1 Mana.) If you can trigger its effect, though, it can start getting decent. 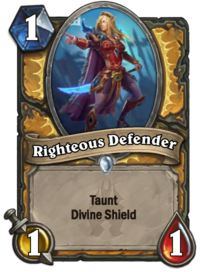 A 3/4 for 4 Mana is about the breakpoint where it starts to be worth it, so you need to try and break at least 2 Divine Shields on your board after playing Light's Sorrow. If by some chance you get more value than that, you're going to be really happy. Of course, you can always buff the weapon after playing it, although the earlier you buff it, the more value you get. I think this card is a bit too finicky overall, so although I think it has the potential to be really powerful, I don't think it's reliable enough to get any better than Fair. Lastly, we have the paladin class legendary, Bolvar, Fireblood, an updated version of Bolvar Fordragon, the paladin class legendary from Goblins vs Gnomes. Bolvar, in both of his incarnations, is a very apt choice for a paladin legendary minion. 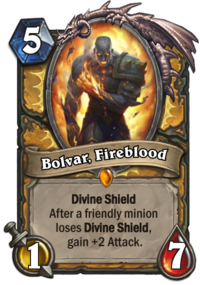 Both Bolvars have the same Mana cost (5) and the same basic statline (1/7), which is pretty poor for 5 Mana. GvG Bolvar is probably a better minion, because his Attack buff effect could trigger far more often, but new Bolvar's effect doesn't have to trigger as often to get out of hand. I like the card, but Bolvar Fordagon didn't see much play back before being consigned to Wild, and still doesn't see much play today, so I'm not convinced Bolvar, Fireblood will either. 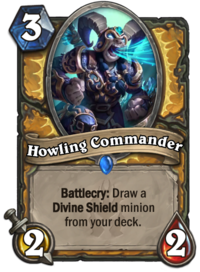 Considering him in isolation, he's probably a Fair card, but with so many Good and Excellent cards already in the game, I'm just not sure paladin decks can make room for him. Next up, some sneaky rogue cards, including the new death knight rogue. That is some freaky hair. They help keep the squirrels out. 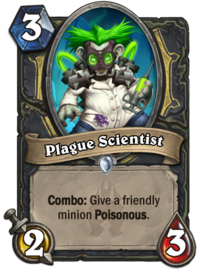 The Plague Scientist has pretty poor stats for its Mana cost. Its value comes from its Combo effect, which is actually pretty good, insofar as it lets you envenom a cheap token and knock out some valuable opposing piece. However, there are just so many good rogue cards out there that I'm not sure it'll see much play. Look at a typical miracle rogue deck, or jade rogue deck, or "burglary" rogue deck. What would you take out to fit this in? I like the Combo effect and its implications, but I can't see my way to rating this card any higher than Poor. The Shadowblade is a neat weapon. 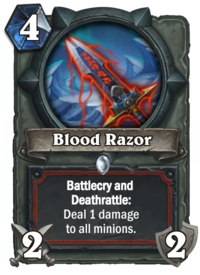 It's functionally equivalent to the warrior standby Fiery Win - I mean, War Axe, but you get to be Immune the turn you play it for 1 extra Mana. I'm not quite sure it's worth it, but I think it's promising. It makes clearing some of those early 4/3 and 2/3 minions a little less painful, at any rate, and that's not bad at all. I think this card is good enough to be Fair. 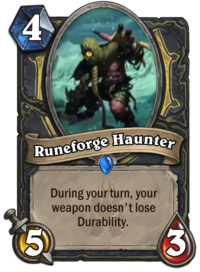 The Runeforge Haunter has an interesting effect, which obviously synergises well with rogue weapons. You wouldn't want to waste this card on the weapon you get from your Hero Power, that's for certain. It has okay stats for its Mana cost, but is on the fragile side. To ensure value, you pretty well need to play this on a turn you've a weapon equipped in order to take a free swing with it. 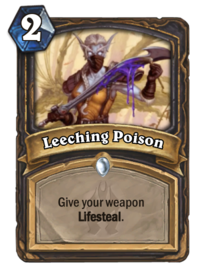 If we start seeing rogue decks with weapons more often, this could be a decent inclusion, though I don't see it being a must-have. It could, I think, lead to some interesting tempo swings. All that said, though, I think it's the higher end of Poor. Lilian Voss is a Forsaken (World of Warcraft free-willed undead who have broken away from the Scourge and are allied with the orcish Horde) who was once associated with the Scarlet Crusade, an organisation dedicated to destroying the undead. I haven't played WoW for several years now, and I don't think I saw her story play out. She eventually helps the player character destroy key Scarlet Crusade leaders, and I think might even play a role as a death knight in other events in the game (most notably the new invasion by the Burning Legion in the Legion expansion). As a Hearthstone minion, she has a Chillwind Yeti body, which is usually the bare minimum standard for "is this 4-Mana card respectable"?. The value, then, comes from her Battlecry effect. Unfortunately, this effect really restricts the kind of decks she fits into: basically, only decks where you expect to have large numbers of spells you won't miss if they're transformed - that is, decks where a lot of your spells are already from your opponent's class. Miracle rogue, for instance, would avoid Lilian like the proverbial plague. For decks that can get value out of her, it's largely going to depend on how many spells you have in your hand when you play her, and what they transform into. So it's going to be pretty random. 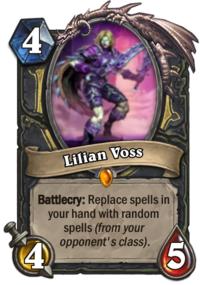 I think it's a bit disappointing to have a class legendary that's so obviously shoehorned into a specific style, but at least Lilian has a role to play. Still, with the effect being finicky and unreliable, I don't know that I can't rate her card better than Poor, which is also pretty disappointing for a class legendary. ... and see a dim vision of our death. 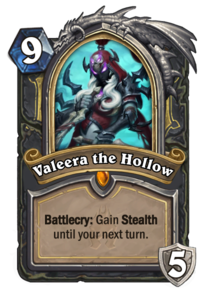 Valeera the Hollow is a very interesting death knight card. She gives you the Hero Stealth for a turn, which is, frankly, amazing - no minion or spell can hit your face on your opponent's next turn! - and she gives you a radically unique Hero Power. It's a first in the game for regular play - a Hero Power that not only doesn't cost mana, but that just takes effect - every single turn. 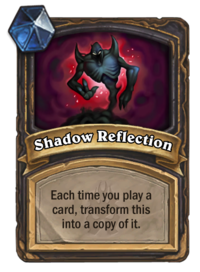 Every turn, you generate a Shadow Reflection, which automatically transforms into the card you've just played. Want an extra Arcane Giant? Or Edwin VanCleef? Comin' right up! I'll be the first to admit that at 9 Mana, this card's sooo slow that I don't know that I'd really find a spot for it in my miracle rogue deck... but if I draw it in a pack, I'm damn well going to try. The upside is that, unless your opponent can break your Stealth (currently only a concern with hunters and anyone lucky enough to generate that spell by some other random source), you're guaranteed at least one turn of benefiting from its powers. At 9 Mana, though, you aren't playing much else on your turn, unless, perhaps, you've a discounted Giant to play or something. So it's a pretty big tempo killer - worse than Sprint, which, if you couldn't discount it, is one of the worst cards to play, tempo-wise, in the game. You need to be able to set up amazing tempo plays in the turns afterward to make up for it. I really really like this card. Taken in isolation, I think it's Good - the only thing holding it back from being Excellent is its cost. Last but not least, some cards for Garrosh. be so low-rating, looking like that. and attacks is a classic. She's here to claim your soul. Pun intended, I'm pretty sure. 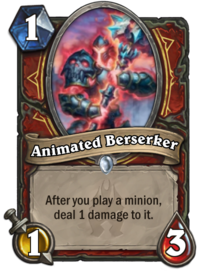 The Animated Berserker is a neat card. At first glance, it might not seem like much, but then, neither did Malchezaar's Imp, and that's got a solid niche going on in discardlock decks. If Grim Patron decks were still common in Wild Format, this card would be an auto-include in those decks. All the same, this card is a good enabler for Acolyte of Pain, Grom Hellscream, Bloodhoof Brave, and a few other cards. It could have trouble fitting into decks that might make the most of its ability, though, except a dedicated "masochist" deck. Because of that possible difficulty, I think it's good for a Fair rating. 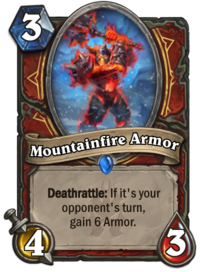 Mountainfire Armor is, in effect, animated armor that fights for you. It has a solid statline for its Mana cost, but has a bit of a finicky Deathrattle, in that it only properly triggers on your opponent's turn. 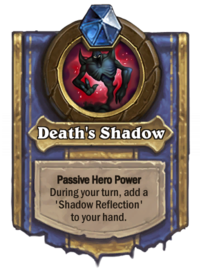 There are five points to be made in defence of this card, despite this finickiness: first, your opponent isn't going to want to ignore this card for long - 4 damage a turn has a way of adding up; second, even if you don't get value from the Deathrattle, you can make valuable trades if your opponent tries to play around it; third, you can feel good playing this on curve; fourth, you'll feel even better if your opponent uses a valuable transform effect (such as Hex or Polymorph) on it; and fifth, if it respawns with N'Zoth, well, you can usually expect a board clear to follow your N'Zoth plays, in which case you're probably guaranteed at least shot of the armour (or a double dip if your opponent killed this minion the first time around). With all that, I think this card definitely deserves a Good rating. The Val'kyr Soulclaimer is kind of like a class-specific Imp Master, where (1) the effect that spawns a token (in the case of the Soulclaimer, a 2/2 Ghoul) differs (the Soulclaimer has to survive damage), and (2) the Ghouls are obviously superior to the Imp Master's Imps. I'm skeptical about the value of this card. It's too slow for the aggressive warrior decks, and probably too fragile for control decks. It might have a home in a board-flooding "masochist" deck: shamans and druids are currently running successful board-flood decks, and with all these "masochist" effects, warrior could possibly make eggs and Patrons work. That being said, this card probably doesn't rate any better than Poor, because it has low impact on the board and is fragile. Bring It On! will, I suspect, be one of the underrated cards this expansion. Sure, giving your opponent a discount on minions seems like a pretty huge drawback. But you wouldn't play this in a deck where you'd feel compelled to play it on curve, when it might hurt. 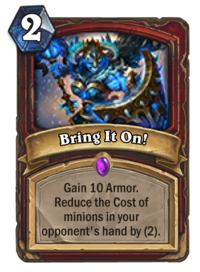 No, this goes in a slow deck, the kind of deck where you play it once you've got a Brawl or Whirlwind/Mosh sitting in your hand, ready to wreck the beefy board your opponent lays down, or once your opponent is running out of cards in hand and won't get much, if any, value from it. It's the kind of card you play to give you that extra edge against Alexstrasza/Pyroblast combos. As long as you're canny about when to play it, this card is a Good card. 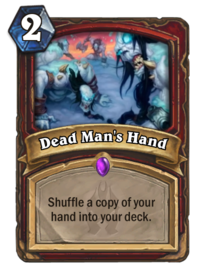 Finally, we have Dead Man's Hand, the card that ensures warrior will win fatigue battles by never going into fatigue. As long as you have two copies of this card, some card draw, and a big finisher in hand, you can play this card and feel really happy, especially since it's only 2 Mana. You can combine it with Bring It On! when you reach the point where your opponent can't get value from the cost discount on minions for extra cheese. This card, at least in my view, is an Excellent card. That's it for now! Tomorrow, we're going to look at two of the three "arcanist" classes (probably Priest and Warlock), and, possibly, round out the post with a few of the newly-introduced neutral cards.